Managed services from Technology Associates provide you with more reliable performance and more predictable expenses. That means you get more value from the technology you've already invested in, while actually reducing the total costs of IT problems and the resulting downtime. Public Cloud Spending is Growing FAST! IDC forecasts that worldwide public IT cloud services revenue (i.e. 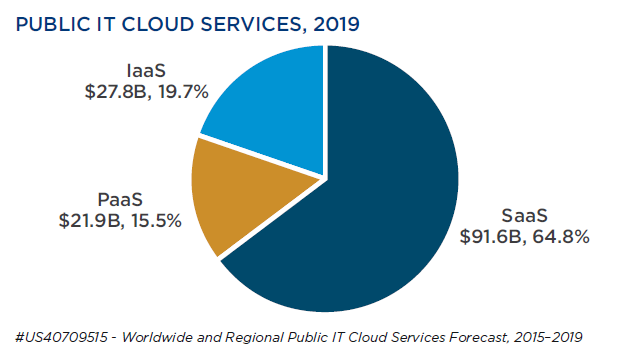 SaaS, PaaS, and IaaS) will reach $141.2B USD by 2019, a 19.4% compounded annual growth rate (CAGR): almost six times the rate of overall IT spending growth! (Ref : The Booming Cloud Opportunity Part 1 - eBook by IDC March 2016). SaaS still makes up the majority of spending, though PaaS and IaaS are expected to grow at almost twice the rate of SaaS over the next five years. Customers are embracing the new cloud technologies and engaging partners to help with the transformation and adoption process. Technology Associates are ideally placed to service these customers and build a solid, reliable and efficient business platform that is scalable, has built-in longevity and releases the burden of onsite maintenance and up front licensing spend into an service based option that scales with the business and you pay only for what you need and use. For a more detailed discussion, contact us today to schedule a call or an appointment. Huge flexibility - increase or decrease users on the fly. Also ask about our hosted server provision (virtual or dedicated servers). On demand access to servers in the cloud as you need them. Technology Associates's on demand services provide you with access to reliable, high-quality Microsoft applications that will serve your business 24/7.